Humans have created maps since ancient times as a way of better understanding the places in which we live. The European Space Agency's Gaia mission did just that—only in a much larger scale—with the release of the most comprehensive star catalogue of our Galaxy, an unprecedented dataset made available to astronomers worldwide on April 25, 2018. The data include high-precision measurements of nearly 1.7 billion stars in the Galaxy and reveal details previously unseen on star brightness, distances, motions, and colors. It's the Milky Way as you've never seen it. Tri Astraatmadja, who was a collaborating member with the Gaia mission prior to joining DTM's astronomy group, discusses the importance of this rich map of the Milky Way. DTM: What exactly is this new star "map"? TA: This new map is basically a catalogue of about 1.7 billion stars around our Sun! It's called a ''3D'' map because now we can reliably tell the distance to about 1.3 billion of these stars. This is a huge improvement to previous catalogues, which at most contain distance information to about 2 million stars. Before this map (and in terms of position), we only knew the direction of most stars, but we didn't know how far they are. Now that we know the distances, we can draw a three dimensional map of the stars and learn how they are distributed (among lots of other things that we can learn from these data, such as their true brightness and speed). This catalogue is made possible due to the Gaia mission, which is a European Space Agency (ESA) space mission that aims to survey all stars around our Sun down to the faintest limit of the instrument possible. Most stars are faint, but since the satellite is quite sensitive to faint objects, we expect to observe about 1 billion objects. The spacecraft was launched in December 2013 and has been taking data since summer 2014. It will keep doing the survey until next year, and it possibly will be extended. In the coming future, we can expect better quality data released by this mission. What's the big deal about this data? The huge size of the data obtained by this satellite is mind-boggling! That's for one. Knowing accurately the distance to the stars is also a big deal, because now we can learn the intrinsic properties of the stars! We can measure the apparent brightness of stars, for example, but if we don't know their distance, we won't know their true brightness. Stars that appear faint can actually be really, really bright but look faint because they are so far away. Similarly, apparently bright stars can be faint in actuality but could only look bright because they are much closer to us. Now that we know the distance, we know whether they are a really, really bright star or a faint star. Combine this information with the star's temperature, and we can also learn their size (in terms of radius) and whether they are giant stars or small stars like our Sun (or even smaller). As a DTM postdoc, Tri Astraatmadja contributes to the Carnegie Astrometric Planet Search (CAPS) project. 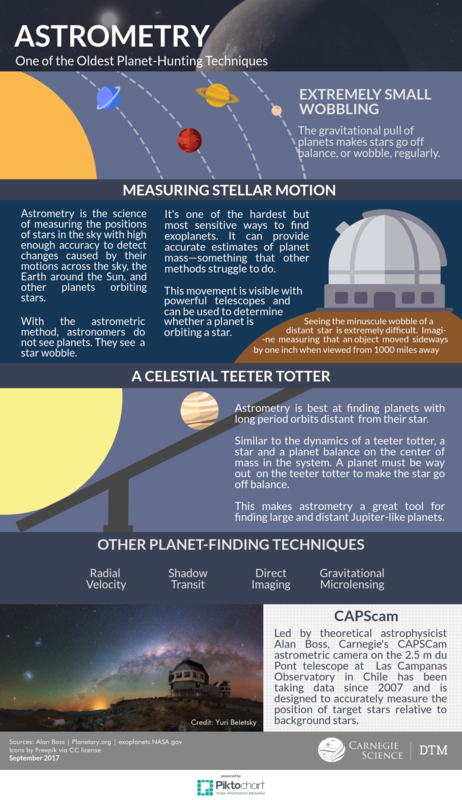 The team is trying to discover exoplanets using astrometry, an old branch of astronomy that measures the position of celestial objects. Photo by Roberto Molar Candanosa. As an astrometrist, I have to place the stars in our observing program into a coherent reference frame. A lot of the stars in our program are too faint to be measured accurately by Gaia, so the data release won't put us out of jobs yet. The brighter stars in the Gaia catalogue can become a good reference frame because they are accurately measured. Since we know their movement, we can also know where they should be at any point in time. It thus becomes a very straightforward process to compare the position of stars in our program against stars measured by Gaia. Didn't we know this information on star distance before? Our knowledge of stellar distances has grown with technological progress. A long time ago we knew only a handful of stellar distances, and we had limited accuracy. Then, we launched a satellite mission similar to Gaia, called Hipparcos, and we got distances to about 100,000 stars. Two years ago the first release of Gaia data offered distance information to about 2 million stars. Now we have that information for 1.7 billion stars. By looking at this number alone we can see that the latest data release greatly expands our knowledge about how stars are distributed in our Galaxy. Knowing how stars in the Galaxy are distributed is also important when studying its structure. What things are still missing in this map, and why? In addition to distance and movement of the stars, at the moment the catalogue only publishes stellar brightness and colors but not their spectra. Stellar spectra is what we get when we pass starlight through a prism, for example, which breaks a beam of light into its constituent light, allowing us to study the stars in even more detail. These spectra allow us to measure not only the temperature with more accuracy than what can be achieved by measuring only the colors but also the abundance of certain chemical elements in the stars. Knowing the chemical abundance of stars gives us a better idea of their age, as heavier chemical elements are formed much later than lighter chemical elements. Knowing this information for a huge number of stars can allow us to learn about the chemical enrichment history of our Galaxy. Unfortunately, Gaia spectra—which will be published in later release—will have such low resolution that it will be difficult to identify a lot of chemical elements. That means that we would want to complement Gaia data with data from other survey programs, such as APOGEE, SDSS, or Gaia-ESO survey that provide high-resolution spectra. The Gaia catalogue also has a brightness limit that makes it exclude really, really faint objects. Currently surveys with fainter limits are being planned. 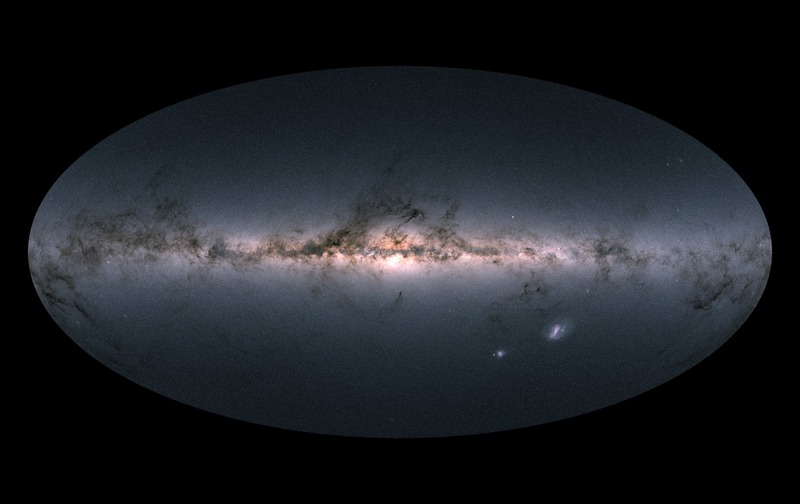 What kind of things will astronomers be able to learn with this new Milky Way map? The catalogue detects a huge number of stars in our Galaxy, so this map greatly improves the knowledge about stars in our Galaxy as well as our Galaxy itself. But let's talk a little more about the main content of the catalogue first before we go on: We know not only the stars direction and distances, but also their movement, their apparent brightness, and their colors. As mentioned previously, knowing distances to the stars lets us learn about how stars are distributed in the Galaxy. Now we also know how they move! This means we can also learn about the dynamics of the Galaxy, such as how these stars move and interact under the influence of the combined gravitational force they exert. Not only that, the movement of these stars could also exhibit signs of gravitational influence exerted by invisible matters known as ''dark matter.'' These are matters that interact with ''ordinary matters'' such as celestial objects through gravitational force, but not through the electromagnetic force. Exploiting our knowledge of the electromagnetic force allows us to detect various forms of light from celestial objects. However, not all particles interact using this force, so we need to get creative in order to detect these sorts of particles.